Status: offline Gosh guys, you're seeing things better than me because I don't see a thing wrong with this guy's shoulder. A little supraspinatus tendinosis, a tiny traction spur on the 2nd rib, no dislocations anywhere, no fractures. If I'm wrong I'll think of something to blame it on. Those film markers are traditionally called 'Mitchell markers'. I think there is confusion between "findings" and "diagnosis". X-rays are rarely "diagnostic". They must, in almost all cases, be clinically correlated(history, exam etc.). Status: offline Great point, Jeep. That's why these cases are so interesting...we have to go the films only, very little history, and no exam. It really sharpens the lens, but I have noticed a tendency (for me anyway) to over-interpret. Status: offline Sorry, don't quite follow you here. I listed some findings, not a diagnosis, unless 'no fractures or dislocations' is a diagnosis. Status: offline Sorry for the confusion Chirortho- my post was not directed AT you, but a comment sorta commenting on your comment---------Does that make it any clearer? LOL! Status: offline Hmmm, what are the findings then Alex? Should be interesting. Status: offline Sorry for being so slow with the findings. I was double checking with one of our radiologists up north. The following is the radiology report. PROCEDURE: Three views of right shoulder. FINDINGS: Lucencies are seen in the glenoid, either subchondral cysts or calcific tendonitis. 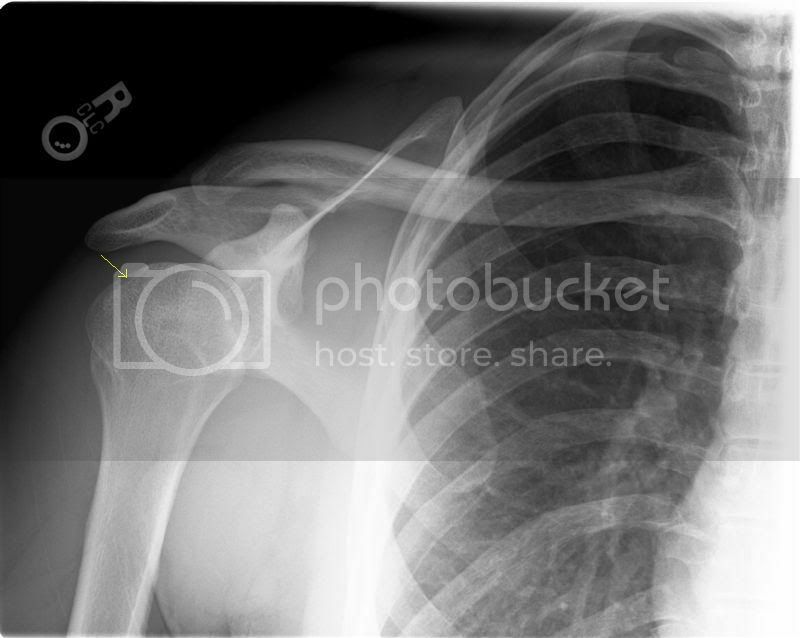 There is a Hill-Sachs lesion of the right humeral head with a bone fragment adjacent to it. No osteophytes are seen to support the presence of osteoarthritis. The right acromion is laterally down-sloping, a finding that may contribute to impingement. There is no definite arthropathy of the acromioclavicular joints. No fracture or malalignment is seen. The yellow arrow represents the small Hill Sachs lesion. The yellow circle is Lance Armstrong's braclet. Just joking, it is what is referred to above as the adjacent bone chip from the Hill Sach's lesion. 1. The Hill-Sachs defect is essentially a small divot in the posterosuperior aspect of the humeral head that is usually seen after repeated anterior dislocations of the glenohumeral joint. It develops due to the impact of the anterior glenoid rim on the posterosuperior humeral head. See http://orthopedics.about.com/cs/othershoulder/g/hillsachs.htm Honestly it's odd that this would be read on these films, particularly since there was apparently no dislocation when the guy fell...VERY odd. 2. The yellow circle is not pointing to the subchondral cyst. The SC is actually in the glenoid, a small radiolucent circle that can be seen on both images just to the right of the humeral head in the glenoid (follow the edge of the humeral head about halfway down and you'll see it in the glenoid). Your circle is pointing to the purported bone fragment from the Hill Sachs lesion. Honestly it looks to me to be SS tendon calcification (calcific tendinosis) but it's certainly possible that it's a bone fragment. If so, it would have to suggest that the guy's shoulder dislocated when he fell then relocated on its own. Alex, if you get a chance, run this by the radiologist and see what he says. To be candid, this is an ODD reading from the radiologist. Have a great day and thanks for all you do here. Let me know if you talk to the radiologist about my comments. I'd be interested in how he responds. Status: offline Thanks Greg. You are correct. I have missed labeled the diagrams. The reason I have taken so long to post the findings were that I was also taken back by his reading. I was really having troubles seeing these but he felt pretty certain about them. I will run these again by a separate radiologist. Thanks again for the information. Status: offline Very interesting! I was actually going to suggest a Hill-Sachs lesion, but given my inexperience with reading films, I hesitated to do so. Greg, the subchondral cyst you're referring to...are you talking about the pencil eraser-sized 'grey circle' just to the right of the humeral head? Status: offline Hey, Alex.. how come that clavicle looks like it's in the wrong position? What's the scoop on that? Status: offline It is the angle of the x ray beam that distorts the view of the film and the clavicle. Which gives me a good idea. Status: offline Ah... why would anyone want the pic distorted? Geesh that is irritating (at least to me). Status: offline Rad tech took a poor film. The QI process at the radiology dept didn't catch it. Status: offline Well, of course! We are talking about the military, aren't we? Haven't you heard, they're all stupid and provide inferior care! Status: offline Did I miss what "derr" means somewhere?